On a recent project in California, some members of the team weren’t completely sold on the benefits of building information modeling (BIM). Getting the most out of BIM can push team members new to the process outside their comfort zone. Key project participants must be involved earlier in the development process to plan, create, and manage a dynamic, multi-dimensional model used for the design and construction of a facility. To accomplish that, participants must work together in a way that’s vastly different from how people and projects are traditionally organized. In other words, there is a learning curve for those inexperienced with fully leveraging BIM. Pushing BIM to its full potential often means an increased up-front investment in time, effort and design costs for a project. This can be understandably daunting, particularly for project owners. But if done effectively and efficiently, BIM minimizes uncertainties and the risk of conflicts and errors, and often reduces the overall time and cost to complete a project. The team was first given eight colored blocks, two-dimensional section plans and elevations, and color and piece schedules for how to build a eight-block structure (Fig.1). They took 10 to 15 minutes to assemble it. Fig. 1 The team was first given these 2D plans and asked to build a structure with eight colored blocks. They took 10-15 minutes to assemble it. The team was then given color photos from different views of another eight-block structure (Fig. 2). They were able to complete the build in less than 30 seconds. We also created a rotating, four-dimensional image of the structure, showing sequentially how to build the structure. That made assembling the structure even more efficient. If it’s true that a picture is worth a thousand words, a three- or four-dimensional virtual model is worth magnitudes more. And the benefits don’t stop at the build team—virtual models help owners, end users, facility managers, and other stakeholders understand how the facility will actually look and function once built, which means they can provide feedback for possible improvements to the design. As many industry professionals can attest, a painful yet all-to-common refrain from owners of traditionally built facilities is: “I just didn’t know it would look like this.” Visualization helps eliminate misunderstanding and miscommunication, and means no stakeholder needs special skills to understand the design. BIM also allows every detail of a design to be reviewed and clashes fixed before construction even begins. This means that a project team can foresee problems in the field before anything is built, eliminating costly rework and construction delays. With BIM, the plans handed to field crews need never be “roughly correct” or “approximate;” there should never be surprises in the field. So, what should be done to reap the biggest benefits from BIM? Using data on over 20 DPR projects that have used BIM, we have gained a few insights. With BIM, the owner and essential design, engineering and construction participants create a virtual model of the project together and determine the best way to build the project. Those participants must be willing to work candidly and collaboratively. Ideally, the owner and key participants come together as early as possible to develop a plan for implementing BIM. optimize the use of virtual design and construction. Discussing these issues often exposes unaligned expectations and potential conflicts, which enables early resolution. This process also helps the project team foster a sense of community and shared purpose, which helps mitigate antagonistic behavior. Making all virtual models accessible in real-time to everyone, from the owner to the craft in the field, is also crucial to identify design innovations, cost savings and potential construction issues. For example, on one recent project, a conflict in the field was uncovered. Upon further analysis, the team realized that the problem was also in the model, but nobody who worked with the model had the field experience to recognize the problem. If a foreman had looked at the virtual model before construction began, the error would have been caught. This is a set of traditional 2D drawings (left) and a 3D model (right) showing the same section of a building. 2D plans require significant training to decipher and even then can be easily misinterpreted. On the other hand, 3D models look very similar to the end result-- what is actually being built, and therefore can be easily and quickly understood. Devising a compensation package that optimizes BIM’s benefits is not essential. But when compensation is structured so that participants have a stake in any cost savings—or cost increases—and are rewarded for any reduction in the project’s delivery time, there is greater incentive for all parties to work together and get the job done efficiently and accurately. Co-locating the owner and key design, engineering, and construction participants involved in the BIM process is not essential either. However, the benefits of the “Big Room” outweigh the costs. Co-locating key participants deepens collaboration, enhances creative thinking, and substantially reduces the time it takes to get questions answered or issues resolved. Construction visualization tools can substantially increase productivity and accuracy if efficiently used. The key is to optimize BIM’s ability to create a facility that enhances the workflow of its future occupants. Ideally, the use of detailed BIM minimizes the cost of operating the facility during its lifetime, creates regulatory documents and coordinates systems. It can also determine the optimal construction approach, minimize errors, identify parts for prefabrication, help with material procurement and track the project’s cost throughout its development. Creating a highly detailed BIM that can be used for multiple purposes creates substantial time and cost savings. For example, a virtual 3D model of a hospital with accuracy down to one-sixteenth of an inch and containing all conduits and pipes over one-fourth of an inch in diameter can be used to produce not only two-dimensional documents for regulatory approval, but construction documents and schedules, and shop-level drawings to drive more prefabrication. DPR has experienced greater productivity with construction visualization. DPR teams are using BIM to coordinate framing with mechanical, electrical, plumbing and emergency systems, which can account for as much as 60 percent of a project’s total cost. DPR has also found that subcontractors have a greater understanding and trust in plans generated from BIM. What’s more, on recent projects, productivity increases four times when using the models directly with a GPS survey system. For example, on a recent project 300 inserts were installed per person when the deck inserts were virtually modeled and coordinated, compared to just 110 to 120 inserts per crew without. 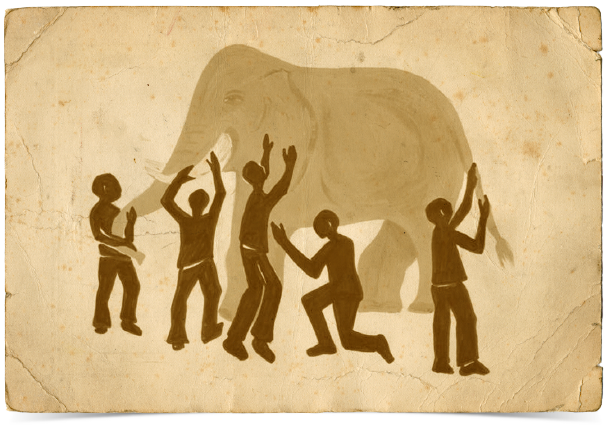 In the ancient Indian fable of “The Blind Men and the Elephant,” a group of blind men are asked to describe an elephant. One man touches the leg, and says the elephant is like a pillar; another touches the tail and says the elephant is like a rope; still another touches the tusk and says he is like a strong pipe. The moral of the story is that the world is viewed differently depending on an individual’s perspective. Similarly, the larger and more complex the construction project, the more difficult it is to see the whole, just like the proverbial blind men. Most project teams struggle to see the whole project from a point of view other than their own. Visualizations enhance the understanding of the wider team and play a role in building the same version of reality for everyone. Connecting the BIM to a weekly work plan by tying tasks to the phase schedule, and then reviewing the sequences to make sure there are no conflicts, is crucial. For a three-story medical office building and parking garage project, construction was initially scheduled to begin with the garage and proceed north to the office building. However, the construction sequences showed that the schedule wouldn’t work because a crane had to be placed where the garage was planned to lift up panels for the office building. After reviewing and discussing the model, the team modified the construction sequence before it became a costly problem in the field. 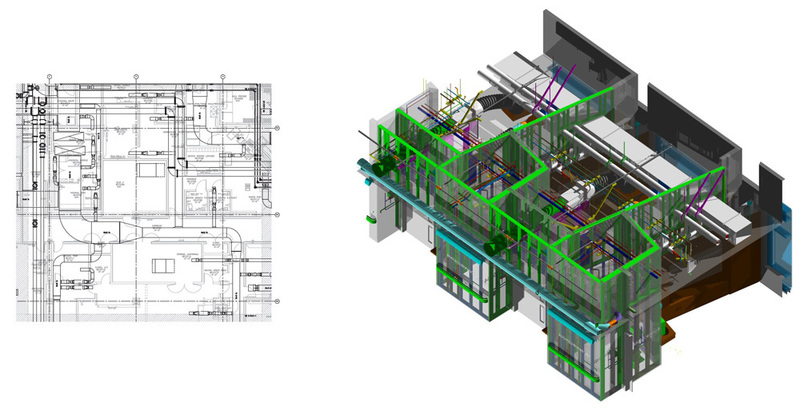 BIM also allows for greater prefabrication in dedicated facilities using sophisticated machinery rather than on site. This means increased accuracy, productivity, onsite job safety and cost savings while minimizing the storage of materials and traffic on site. Fewer vehicles, people and materials on a site is particularly important if a project involves an existing facility that must remain open or if the site has limited space or is in a high-traffic area. Using BIM as a tool also enables smarter materials procurement. Accurate quanitities and delivery dates minimize wasteful orders and inefficient use of site space. It could also provide more strategic ordering agreements to take advantage of cost savings and new technologies. Technology is now enabling the creation of immersive reality environments, where people can walk through and experience a virtual model of a project before it is completed. In fact, a safety inspector did just that at a recent DPR project. With marker-based augmented reality, a virtual view of a room or section can be generated as finished space—before it’s completed—and superimposed on a floor plan or in the raw space. Currently, marker technology is only being used in the most “valuable spaces,” such as operating rooms, allowing builders to see whether the area can accommodate the planned equipment and whether vents and electrical outlets are in the right place. Marker technology also works in reverse, providing a view through walls and ducts, which is useful for facility management or future renovation work. Adopting visualization tools may soon become a requirement for developers and building owners. A handful of cities have hired software companies to create virtual versions of those cities with as-built information of the structures within their limits. In those cities, developers will be required to insert their as-built 3D model into the city’s virtual version. DPR has made a commitment to visualization by developing BIM expertise and investing in the software and equipment to maximize BIM’s benefits. DPR believes that using construction visualization is the most effective and efficient way to do business, offering greater predictability of outcomes for valued customers and their end users.